Multicellular organisms’ bodies contain two types of cells; somatic cells and reproductive cells. Each type is divided in a special way. Cells in multicellular organisms are divided in different ways to achieve different processes. Somatic cells are divided by mitosis which leads to the growth of living organisms and compensation of the damaged cells. Reproductive cells are divided by meiosis which leads to the formation of male and female gametes, which are responsible for reproduction in living organisms and the transfer of genetic traits from parents to their offspring. The cell nucleus contains the genetic material of the living organism. This genetic material consists of a number of chromosomes which have the main role of cell division. The chromosome consists of two connected threads at the centromere. Each thread is called a chromatid. The chromosome chemically consists of nuclear acid, called DNA, and protein. The DNA carries the genetic information of the organism. The number of chromosomes in living organisms is different from one species to another but fixed in the members of the same species. Somatic cells in most living organisms contain two sets of chromosomes (one inherited from the father and the other inherited from the mother) known as diploid number 2N, while the gametes (male sperms and female ova) contain the haploid number N. knowing the number of chromosome helps in determining the animal and plant species. Mitosis occurs in the somatic cells of organisms. It leads to the growth of the living organisms and compensation of their damaged cells. Chromatin reticulum condenses and appears in the form of long, thin and double strings (chromosomes). A network of filamentous fibres called a spindle is composed and extends between the two poles of the cell. The spindle fibres in the animal cell are formed from the centrosome. In a plant cell, the spindle is composed of the cytoplasm at the cell’s poles. Each chromosome is connected with one of the spindle fibres by the centromere. At the end of this phase, the nucleolus and the nuclear membrane disappear. In this phase, chromosomes are arranged along the cell equator where each chromosome is attached with one of the spindle fibres at its centromere. The centromere of each chromosome splits lengthwise into two halves. Chromatids in each chromosome then operate from each other and become separate. Spindle fibres begin to shrink so two identical groups of chromatids are formed. Each group migrates towards one of the cell’s poles. In this phase, a series of adverse changes occur which lead to the formation of a complete set of chromosomes that have the same number of chromosomes as the mother’s cells. Nuclear threads, a nuclear network and then two new separate cells are formed. Each cell has the same number of chromosomes as the mother’s cell. Meiosis occurs in living organisms that reproduce by gametes. In humans and animals, this division occurs in the testes to produce male gametes (sperms) and in the ovaries to form the female gametes (ova). Similarly, in flowering plants, this division occurs in the anther to produce the pollen grains and in the flower’s ovary to form an ovum. Meiosis is different from mitosis in that each produced cell contains half the number of chromosomes of the parent cell. 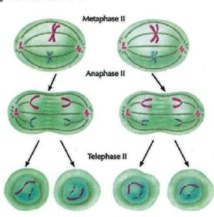 This reduction occurs by the meiosis in two successive stages, where the chromosomes are doubled once in the interphase that takes place before the beginning of the first meiotic division. Chromatin reticulum intensifies and appears in the form of distinct chromosomes. The chromosomes are arranged in homologous pairs, each pair consisting of 4 chromatids and called a ‘tetrad’. At the end of the prophase 1, nuclear membrane disappears and every two homologous chromosomes (in the tetrad) start to move away from each other. Each chromosome consists of two chromatids linked together by the centromere. The spindle appears and the chromosomes get connected with spindle fibres. In this phase, chromosomes pairs arrange on the cell’s equator. In this phase, every two homologous chromosomes move away from each other as the spindle fibres shrink. One of the two chromosomes migrates towards a cell pole and the other migrates towards the other pole. Each pole contains half the number of chromosomes of the parent cell. In this phase, at each of cells poles, a nuclear membrane is formed around the chromosomes so there are two nuclei. Each one has half the original number of chromosomes of the parent cell. Then the cell enters into the second meiotic division. This aims to increase the number of produced cells. Each cell is called a gamete, containing half the number of the species’ chromosomes. Each cell of the two cells which resulted from the first meiotic division is divided in a way similar to mitosis. In the final phase (telophase II) of this division, four cells are produced and each of them contains half the number of chromosomes of the parent cell. When a male gamete combines with a female gamete, the zygote is formed. It contains the same number of chromosomes as the original organism. Thus, the number of chromosomes remains constant in the cells of individuals of the same species.